Maritime History in Art showcases the unique legacy of one of America's most prolific marine artists, James Clary (1939 - 2018). His dedication to history, exhaustive research, attention to detail, and fascination with all facets of maritime lore endures in his original paintings, lithographs, pen and ink illustrations and books. We invite you to explore the web site to view fine art, wall art, and prints for sale — or come visit the gallery in St. Clair, Michigan. 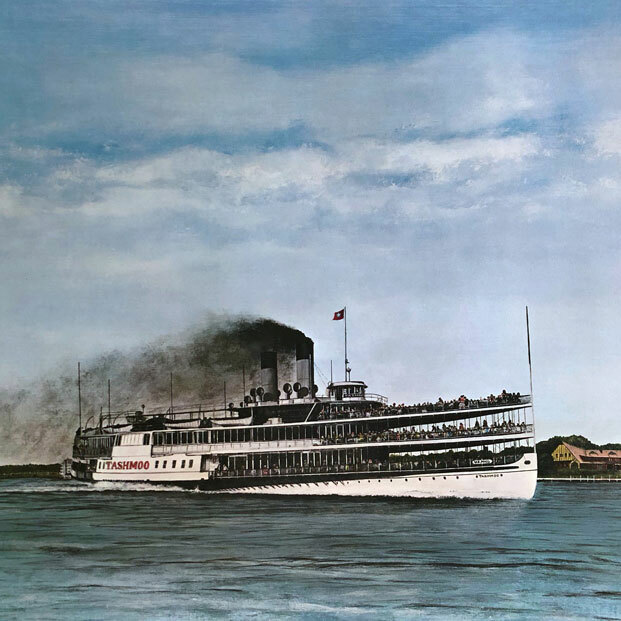 Freighters, frigates, and schooners make up the ships in the Great Lakes Series and feature many of Jim Clary’s earliest works Such as the Tashmoo and the Edmund Fitzgerald. Jim Clary’s renown series of world-famous vessels featuring the Titanic, Old Ironsides, the USS Enterprise, and the US Coast Guard Eagle are presented in the Classics of the Seas Series. The Feared Lost Series portrays the unusual and compelling mysteries of the seas. The sinkings, the shipwrecks and uncanny naval disasters come alive through Clary's haunting paintings. 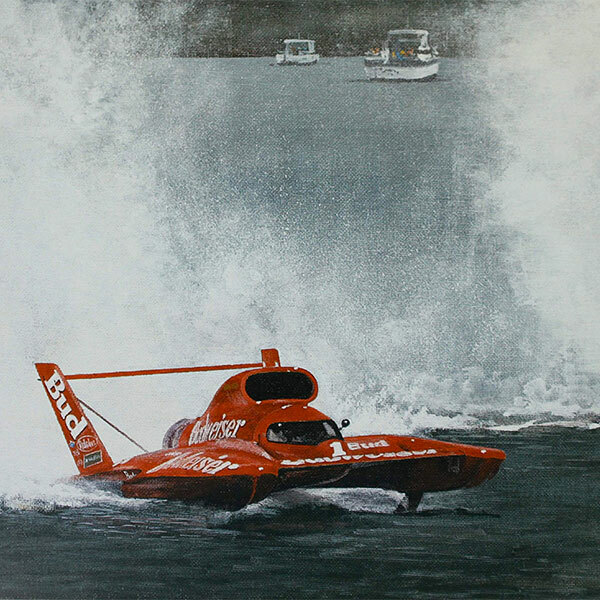 Capturing the spectacle of speed and sound, the Famous Thunder Series features some of the world’s fastest offshore powerboats reaching speeds as high as 150 mph. Commissioned to paint the most accurate depictions of the wreckage, Clary showcases seven haunting paintings and pen & inks from the 1994 expedition supervised by Dr. Joseph MacInnis. Portrayals of the twelve vessels lost with all hands during the 1913 storms. Each work was the result of a study of all the known particulars, weather, location, and demise of each vessel. The Miniature Series is a collection of detailed and beautifully composed subjects encompassing major moments of maritime history. Bridges, tugs, waterways, and locks, Clary found great enjoyment creating smaller works of larger-than-life legends. When she sank in 1958, two surviving members swore she broke in half while the company that owned her claim she went to the bottom in one piece. The 1997 expedition on which Clary was co-leader proved the crew members were right. See the paintings and the pen & inks here. Over a career spanning almost fifty years, Jim Clary produced dozens of pen and ink illustrations. Portraying freighters, frigates, schooners and clipper ships known worldwide, the Pen & Ink Series presents many of his most popular studies still available and ready to frame. Jim Clary’s love of the sea formed in his youth near the Detroit River where his desire to draw the passing vessels was born. While still a young boy his family moved to the rural town of Richmond, Michigan, where he would spend much of his time exploring the St. Clair River in St. Clair, a small town just south of Port Huron. As he grew, his interests in painting and collecting bits and pieces of maritime history would deepen and evolve into a profound union of historical accuracy and artistic detail — the trademark characteristic that made him famous. His renown among maritime museums and private collectors around the world afforded him many adventures. Among them the 1983 expedition which located the Titanic, the 1994 Edmund Fitzgerald expedition, the 1997 Carl D. Bradley expedition, trips on many Great Lakes freighters, a hook landing on the aircraft carrier USS Enterprise, and a reenactment of the deck fight aboard Old Ironsides, the USS Constitution, to name just a few. These and countless other experiences, treasured conversations, and thousands of hours researching long-forgotten legends and mysteries are captured in a lifetime of artwork. His contribution to the legacy of the Great Lakes and maritime history lives on.